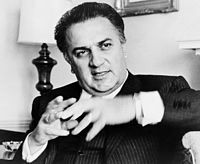 Federico Fellini (January 20, 1920 – October 31, 1998) was an Italian film-maker. Simple: A different language is a different way to see life. Simple: All art is saying something about the person making the art. A pearl is the oyster's story about the oyster. "Even if I set out to make a film about a fillet of sole, it would be about me." Simple: Even if I decided to make a movie about a piece of fish, the movie would be about me. This page was last edited on 18 February 2010, at 03:17.